Wow, what a story! While I think that Mrs. Brannigan’s choice to feign adoption in order to keep her own son is a sad commentary on black/white race relations, I honestly admire her commitment to her child and think her solution was clever. 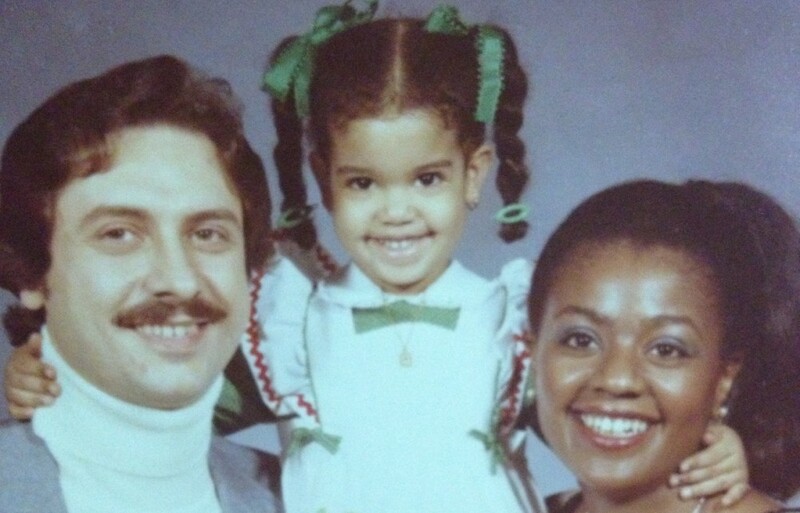 This certainly is a unique story of “transracial” “adoption”. Tim Brannigan likes to say that he was born on May 10, 1966, and that he died the same day too. Minutes after his birth, Tim was ferried away from his mother Peggy, who subsequently told her own parents, siblings and her three other children that her baby had died in childbirth. For the next five days in Templemore Hospital in Belfast, Peggy Brannigan had one ashen-faced visitor after another express their deepest condolences for her loss while, just a few doors down, her baby gurgled and cooed away like any healthy newborn. The reason for the deception was that Peggy was a white woman married to a white man, and her new son was black. During a difficult period in her relationship with her husband Tom, Peggy had met and had a brief affair with a Ghanaian doctor named Michael Euke. When she became pregnant, Peggy panicked and told her husband that she had been raped. When the baby was born, Tom went along with the charade. Somehow, Peggy also convinced the hospital staff to assist in her scheme. The plan was for Tim to be smuggled to an orphanage under strict instructions that he was not to be adopted. Peggy needed time and headspace to figure out what to do, but the plan was eventually to ‘adopt’ her own son. To her credit, by the time of Tim’s first birthday, he was living with his family deep in the heart of the Falls Road. EastEnders scriptwriters would throw out that idea for being too far-fetched, but it’s all true, and laid out in honest, mind-boggling detail in Tim’s new book, Where Are You Really From? Speaking to Weekend on a recent visit to Dublin, Tim recalls the night that his mother finally confessed the truth to him. It’s a bombshell by anyone’s standards, but Tim, astoundingly, managed to take the news in his stride. He remembers crying, but from happiness. Having had years to absorb the story, and the chance to revisit his origins through writing the book, Tim says that he understands his mother’s desperate motivations after he was born. “I think she was very proud, and was part of a culture of looking out the net curtains and judging others,” he says. Peggy went on to tell Tim about his real father, who had refused to support Peggy and had only ever seen his son once as a toddler. Nevertheless, Peggy seemed to want Tim to find out more about his father. “She wanted me to be excited about having this father all of a sudden, but I had no initial desire to meet him,” Tim says. It would be almost 20 years before Tim finally did meet him. In the meantime, Tim completed a degree in politics at Liverpool Polytechnic, but it was the explosive politics in his native town that were to define his 20s and 30s. 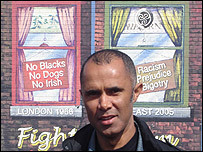 …Surprisingly, Tim reveals that the most sustained racism he ever encountered in his life didn’t come from his neighbours on the Falls Road, schoolmates, Republican comrades or Loyalist foes, but rather from the British Army — even its black members. … Sadly, his mum’s health took a turn for the worse in October 2002 and, for the best part of two years, Tim nursed her until she died from a brain tumour in March 2004. With his mother’s wishes in mind, Tim decided to track down his father three years ago as part of a BBC Radio documentary. It’s a journey that brought Tim as far as Ghana to eventually meet his birth father. Along the way, Tim discovered that he had five brothers and sisters on his father’s side, many of whom live in London. After showing initial enthusiasm towards Tim, they have since cut off contact. They’re likely taking the cue from their father. The last time they spoke, or had any contact, was by text and an argumentative phone call over Christmas 2008. Now that his story is out in print, there could be a chance of reconnecting, but Tim isn’t going to hold his breath. “I think a couple of them are on Facebook so I probably will message them to say, ‘Brace yourselves’,” he says with a smile. So has Tim dealt with what must be deep disappointment, and made peace with the fact that any kind of relationship with his father and half-siblings looks unlikely? This entry was posted in biracial, books, equality, race and tagged adoption, biracial, ghana, ireland, mixed race, ronan lang, tim brannigan, where are you really from? by Tiffany. Bookmark the permalink.